WOAP pundits Tom Swithinbank, Nathan Evans, Ian Hemmens and Nikhil Vekaria share their views on Bradford City’s thumping victory over Walsall, the new striker partnership, and the club’s prospects for the final two games. How impressed were you with that performance? Nikhil: In a word, very! I was surprised that we won so comfortably due to Walsall’s strong league position but we never really looked like getting beaten. They only had the one chance of note when they hit the bar and we created so much, even in the first half. I think it was vital that we scored early in the second half, as we’ve struggled with goals lately and it relieved a lot of tension within the crowd. I was also very impressed that we continued to push forward after the goal, as we sometimes rest on our laurels at 1-0 and put ourselves under unnecessary pressure. Reece Burke, Lee Evans and Josh Cullen were superb again. Ian: Very impressed, Walsall came with a good record and had been near the top all season. I was expecting a nervous start but both teams went toe-to-toe trading attacking moves which made for an exciting, enjoyable game. After the teams went in equal at half time I expected both to be more conservative and maybe one goal either way would settle the contest, but after Filipe Morais’ scrappy opener, his enthusiasm and joy seemed to lift the whole ground and team to another level. A superb solo goal by James Hanson got the crucial second and we took control of the game from then on with, if I recall, Ben Williams had only one save to make tipping a great effort over the bar. For me, the best performance of the season. Nathan: I agree with Ian, it was the best performance of the season. We dismantled Walsall from top to bottom, and to be completely honest the score line could have easily been more if it wasn’t for Etheridge in the opposition goal. We dominated another team likely to finish in the play offs both going forward and at the back, and scored a huge psychological win and confidence boost in the process. It was nice to see us finally really attack a team and big some goals and who knows if we managed that against Shrewsbury and Coventry we would be knocking on the door of Burton Albion; but that’s football for you. Tom: As Jason said it one of those games where every player brought his A game and Walsall couldn’t cope with our relentless pressure and closing down. Phil Parkinson wants hard work and commitment when we don’t have the ball and calmness on it and I thought on Saturday we had that balance perfectly. Fans seem to have a mixed view of Lee Evans, but I thought he typified that mix physicality and composure and what about Josh Cullen, he’s going to be a top player isn’t he?! What did you make of the Morais/Hanson partnership? Nathan: A breath of fresh air. Both were extremely driven and determined to make an impact from the start. Morais seemed to understand where the ball would drop from Hanson’s knock downs, something Billy Clarke has failed to do to a high standard for a while now. For Hanson he had a point to prove, with the acquisition and fine form of Jamie Proctor of late, Hanson has taken a bit of a back seat recently. However it’s clear to see that he still sees himself as our main striker and I can only agree with that. 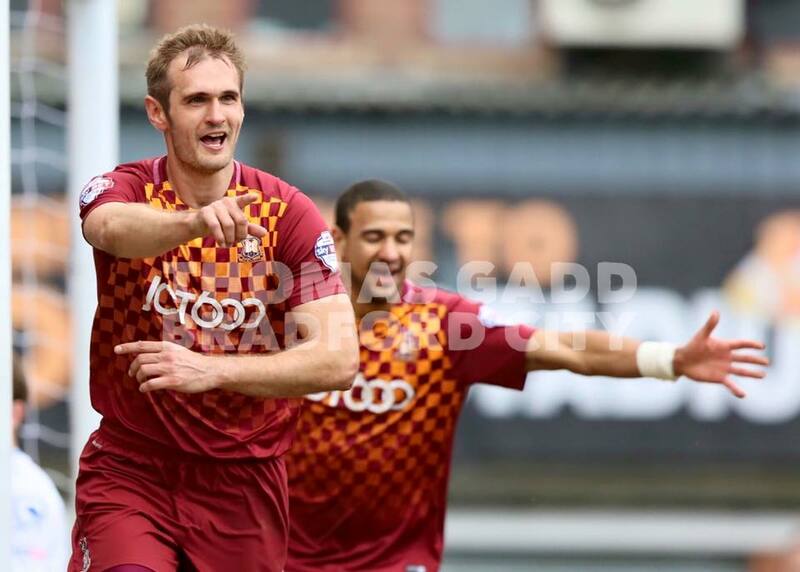 James Hanson epitomises everything great about our club and always seems to have a goal in him when it’s most needed. With his hat trick he’s moved up to become City’s third all-time top goal scorer. Filipe Morais too had a point to prove but for a different reason. His very lengthy spell on the sidelines with his most recent injury was a difficult one to take for all involved with the club, and his relief after scoring his first goal since his return was clear to see with the celebration he embarked on, running over to the bench to embrace both Nick Allamby and Matt Barras with the rest of the squad. Morais was fantastic; it feels like we have a new signing in him after his long layoff. Tom: I thought it looked really good. Morais can drop deep into that pocket of space but he also has the pace and desire to go beyond a big man and get on the end of his flicks, as he did for the last goal. Morais sounds like an infectious personality, and it was great to hear him talking in the press about how he was constantly talking to Hanson and egging him on during the game. I think as long as they are both fit on Saturday they should start and keep the continuity going. Jamie Proctor is a good player to have on the bench too if needed. Ian: After a stuttering first 10 minutes they noticably started talking and encouraging each other, and things began to click into place. The enthusiastic and energetic Morais dovetailed with the robust Hanson to create many problems for the Walsall back line. Morais was dragging defenders all over, dropping deeper and then running beyond James in anticipation. Filipe was rewarded for his hard work in coming back from a terrible injury with his goal. He looked to tire at one point, but then found extra energy to bamboozle the excellent Kinsella of Walsall and set up James for his hat trick goal. It just showed that if you give James the service he will score. I might be wrong but I think that puts him level with Dean Windass in terms of league goals for City. Only the legendary Campbell and O’Rourke stand in front of him. Not bad company to be in for someone who, for some reason is the, in my opinion, the unfair target of criticism at times. Nikhil: I was really impressed! I had my doubts over Morais up front, but he worked really hard and made great runs. His cross for Hanson’s third was perfect and I was delighted for him when he got his goal. I also thought James was very good and took his goals very well. He also made great runs and didn’t give away any silly fouls, which let us build pressure on Walsall. They also looked to have a good understanding of each other’s movement, which was impressive as they hadn’t played up front together before. If you had to give the man of the match to someone other than Hanson, who would it be? Tom: Reece Burke and Josh Cullen always seem stand out for me, but I’d like to point out the contributions of Stephen Darby and James Meredith. What signings they have been; Peter Beagrie said back in August they were the best in the division and I think I agree. They are very solid, rarely beaten one on one and back their wingers up as much as possible. My dad and I were commenting on Meredith’s fitness, he covers so much ground up and down that left wing but it’s his intensity and power that impresses so, for me, he would have been man of the match. Ian: For me, it has to be Josh Cullen. I think this little pocket dynamo has been the catalyst for City’s surge towards the play offs. His non stop running, intelligent passing and will to win reminds me of a small ginger haired lad in 1982, who played in much the same way and inspired those around him to greater heights. In my opinion Josh will become a top player as he grows and matures. I wasn’t happy when Gary Liddle left, but Josh has been superb for the team. Nikhil: Reece Burke would be the other option for MOTM for me. The boy just oozes class. He always looks composed on the ball and is so strong in defence as well. He didn’t allow himself to be bullied by the Walsall attack, which had pace and broke in numbers. He stayed strong and was very good in the tackle, not giving away any silly fouls and managing to keep on top of the strikers. I also love the way Burke carries the ball out of defence and thought he did this well on Saturday, as well as the ‘dirtier’ side of defending. I think the whole defence was also superb and allowed Walsall nothing. Nathan: There were a lot of big performances, and trying to single out a man of the match other than Hanson is a difficult task. The back four and Ben Williams obtained another standard clean sheet against one of the best attacking sides in League One, but for me I’m looking at Filipe Morais, Lee Evans and Josh Cullen. Evans and Cullen are fantastic in the centre of the park, they dominate other midfields on their day. They have quickly become fan favourites at Valley Parade with their attacking mind-set, ability to spray the ball around and with their high levels of consistency. Both have a very bright future ahead of them in football. I’m going to have to give it to Morais though. He had an unreal match with a goal and an assist and was a constant thorn in Walsall’s side. To come back from a severe injury and perform like that in his first start, hats off to him. What’s the target for these final two games? Nathan: Two wins and two good performances to hopefully go into our play off campaign with some real momentum would be perfect – and should be what we’re aiming for. With a five point gap on seventh place, two games left and a now competitive goal difference we have basically obtained our top six spot and wesimply just need to keep up the good work. Our final placing within the play offs is more important in terms of home advantage than opposition, in my opinion, as on our day I fully believe we can beat any of the sides around us in the table. However, I would certainly prefer us to play at Valley Parade in the second leg of the play off semi-finals, if we finish in the top six, as the atmosphere our fans drum up can certainly take the lads over the line if needed. Nikhil: I think with the mad way this season has gone, on we need to seal the top six as soon as we can so I hope we can do this at Southend next week to avoid any possible dramas on the last day! It would also allow us to rest a few players against Chesterfield before the play offs, which I think could be valuable. Ian: Well, two victories obviously, but I would settle for a point at Southend and a victory at Valley Parade against Chesterfield. Wherever we finish, I don’t think any team will fancy playing us although I personally wouldn’t fancy Barnsley – they have shades of ourselves in 1996. Tom: We’ve got to look to win them both, anything less will be a disappointment, firstly we need to secure a play off spot and although the stats over the years may disprove this, I think finishing third or fourth and playing at home in the second leg is a big advantage. Valley Parade will be rocking if we reach the play offs, and no-one will fancy playing us! From a personal point of view I hope we don’t end up playing a southern based side like Walsall or Millwall away in that second leg, as I wouldn’t be able to go! Nice to hear people’s thoughts. I really enjoyed Saturday’s game from the start. I must admit that in the opening 10-15 minutes I was a little concerned at the lack of support for Hanson as there seemed to be a lot of space around him as non of the 4 midfielders or Morais seemed to be getting up there when he won headers. However the game progressed beyond my wildest expectations. Morais has been my favourite player since watching him away against Halifax in the FA Cup last year and I was gutted at hide riots injury in preseason. I am delighted for the guy that he had one back in the team and shown what a great player he is. Along with Billy Clarke and Reid he is one of the three players in this squad who can beat a man or make things happen. Flair players if you like. I have been a huge fan of Meredith over the past few seasons. His work rate is incredible at times. He is no mug on the ball either. I cannot say he has ever been the most disappointing player on the pitch when I have seen him in the flesh. So proud of the team and manager for responding to the unjust results against Shrrwsbury and Coventry that preceded Saturday’s game. Real character!!!!! “We’ve got to look to win them both, anything less will be a disappointment” – really ?!?? We need to win all 5 remaining games. We can. Saturday’s match was very important as all of the top teams have players who can turn and win games. The difference is often made by what is going on in players heads. I’d prefer City got Walsall in the play offs. Of all the four teams likely to be there, they are the ones who have the least momentum, and getting beaten all over the park at Valley Parade wont have helped either. Likely to be Milwall, though I’m sure we’ll end up playing two of the three at some point over the next few weeks. Out of all the teams in the play offs and also those potentially has a chance I’d prefer Millwall for our semi final game as I think we have their number with Walsall in the final.